Australian icon, Tom Williams, is joining Bean Media Group on stage at an exclusive media industry event on 16th March 2011. Bean Media Group has confirmed that the company will host an exclusive media event on Wednesday 16 March in the City of Sydney. This much-anticipated gathering will be hosted by Great Outdoors and Dancing with the Stars legend Tom Williams, and Bean Media will also be giving away a trip for two to Las Vegas. Bean Media Group is a leading media company based in Sydney that publishes the multi award-winning series of business magazines entitled Australia's Best. Its publications are widely regarded as the leading series of B2B magazines in Australia, and its reputation has been further underscored by two major awards in the category of B2B Magazine Of The Year at a recent Publishers Australia Excellence Awards. Bean Media will showcase its award-winning series Australia's Best, which covers a wide range of industries including Manufacturing, Retail, Building, Construction and Mining. This short industry event will include free drinks, complimentary canapés, and an amazing chance to win a trip for two to Las Vegas. The trip will include return flights, accommodation, transfers and full travel insurance for two people for four nights - an opportunity not to be missed! This event is by invitation only, and guests will consist of top media executives from marketing, media and communications agencies throughout Australia. Bean Media Group constantly receives positive feedback from media agencies and their clients who have seen great results from showcasing in Australia's Best. With unrivalled quality, a fully audited CAB circulation, and numerous awards, Bean Media Group's portfolio of business magazines are regarded by many as market leaders. This exclusive industry event is not to be missed, so save the date - Wednesday 16 March 2011. To claim one of the limited free-of-charge places, call Paris Brooks on (02) 9939 7899 to confirm your attendance. Alternatively, a personal invitation will be arriving via post for advertising and media executives selected to attend. Bean Media Group is a multi award-winning media company located on Sydney's North Shore. 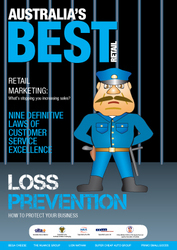 The company produces the leading series of B2B magazines entitled Australia's Best.